After seeing the tremendous need of the people in our target area of Emmaus, KZN, we started the ShareCare programme. It is aimed at connecting a more prosperous family with a family in absolute poverty and dire need. For example one family we care for: there’s a ninety year old woman who is still working and cooking, caring for and feeding 10 people off her meagre state pension. She has little help and takes care of children ranging from babies to school going age. Other members of the family have died and left the children to be cared for. Where God has blessed many of us in our schools and suburbs and towns, we are often unaware of the tremendous poverty and desperation of other families calling out to God for help. Often when Arise MG members arrive with the food parcels the older women cry with gratitude and relief for the help that has arrived. You can make a remarkable difference in the lives of these families as well as open them to the gospel as they see the church of God coming through for them. 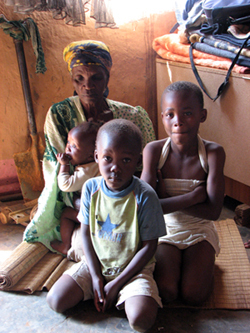 By donating R300 ($40) you can secure a 25kg bag of maize meal and other basic foodstuffs for one of these families. and widows in their distress and to keep oneself from being polluted by the world.